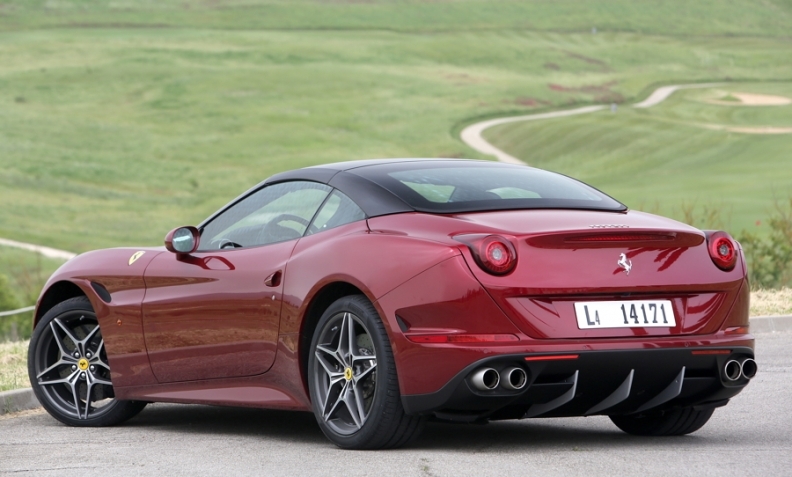 Ferrari's turbocharged California T is 14% more powerful than its predecessor but emits 16% less CO2. SIENA, Italy -- Ferrari wants to reduce its fleet carbon dioxide emissions by 20 percent by 2021 while simultaneously boosting performance. To do this the supercar maker will use turbochargers on V-8 engines and hybrid systems on V-12s, Ferrari Powertrain Director Vittorio Dini said. "Our average CO2 emissions are currently about 270 grams of CO2 per kilometer. We want to use all the available technologies to reduce emissions by 3 percent each year, which means approximately a 20 percent decrease by 2021," Dini told Automotive News Europe. Ferrari’s average CO2 emissions have fallen by almost 40 percent since 2007, at which time they were 435g/km, Dini said. Although it is part of the Fiat Chrysler Automobiles, Ferrari is treated as a stand-alone company when it comes to meeting tougher global CO2 emissions targets. This is because of Ferrari’s small size and the fact that the Italian brand has a different headquarters than parent Fiat and has its own technical centers. One benefit of its low-volume production -- roughly 7,000 units a year -- is that Dini said Ferrari has been able to negotiate its own targets with both European Union regulators and officials at the U.S. Environment Protection Agency. "What is important is that Ferrari achieves the same percentage reduction trend as volume automakers," Dini said. Ferrari already has successfully cut CO2 while boosting performance with help from turbocharging in the recently launched California T coupe-convertible. The supercar’s turbocharged 3.9-liter V-8 gasoline engine creates 552 hp and emits 250g/km of CO2 while its predecessor’s 4.3-liter naturally aspired V-8 offered 483 hp and emitted 299gkm of CO2. “In the future, all of our V-8s will use turbos,” Dini said, adding that Ferrari’s next challenge is to decrease the displacement of its V-8s while adding even more power. Dini said Ferrari would count on hybrid solutions to cut fuel use and emissions on V-12 engines, which are currently found in its top-of-the-range F12 Berlinetta and FF models. Ferrari showed what is possible from this strategy last year with the introduction of its first hybrid model, the limited-edition LaFerrari. The supercar, which costs more than 1 million euros before taxes, gets its power from an 800-hp normally aspirated 6.3-liter V-12 and a 120 kilowatt (equivalent to 163 hp) electric motor. The La Ferrari has a combined 963 hp and emits 330g/km of CO2 while the model it replaced, the Enzo, offered 660hp and emitted 545g/km of CO2. Dini said turbos are not a good solution for Ferrari’s V-12s because four turbo units would be needed to achieve the required improvements. This would take up too much space and create too much heat in the engine compartment.